This Easy Turkey Bolognese Sauce is such an easy weeknight dinner! 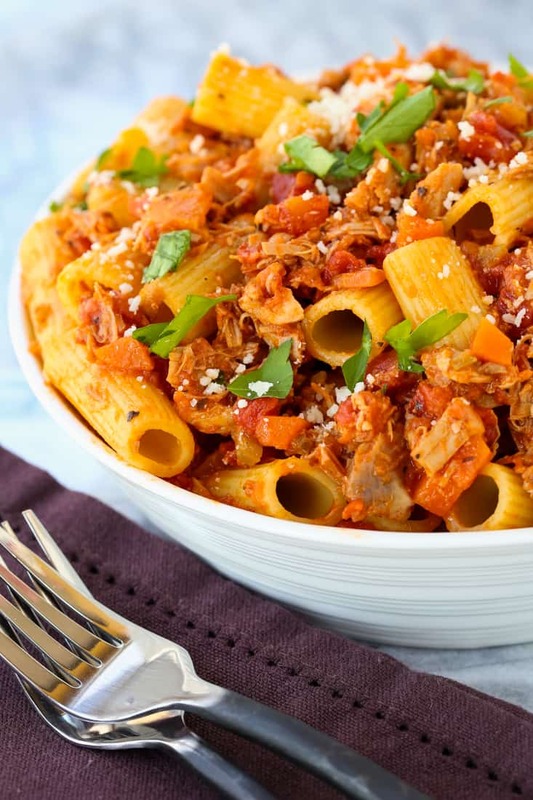 Leftover turkey is perfect for putting this bolognese together in just minutes! Leftover turkey recipes can easily be swapped with leftover chicken, too! This Leftover Turkey Shepherd’s Pie or this creamy Turkey Tetrazzini are perfect examples! You can also use the same method for our Homemade Turkey Soup with a leftover chicken too! Bolognese sauce is traditionally made with some type of beef. Usually ground beef but I’ve seen it made with pieces of leftover beef or steak, simmered for hours until super thick and creamy. 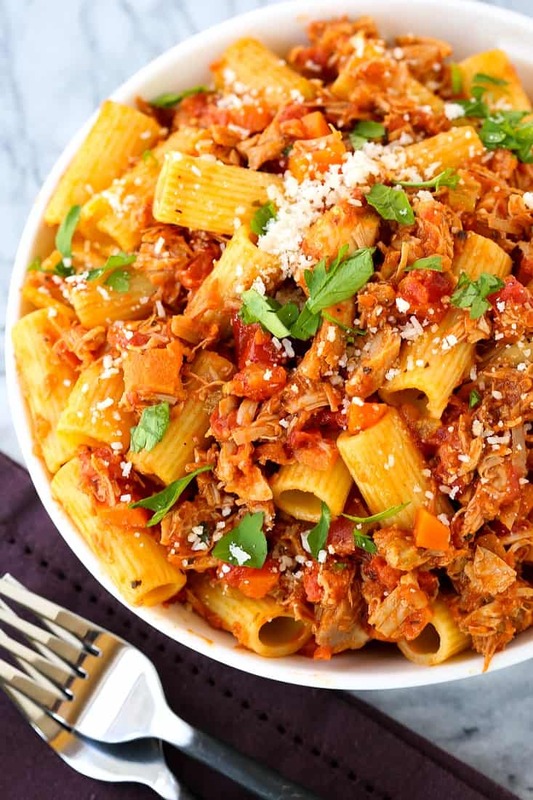 This Turkey Bolognese will give you all those same flavors, lightened up and in just 30 minutes! 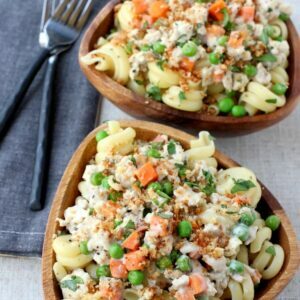 We’re using leftover turkey for this pasta recipe but you can substitute leftover chicken as well. No leftovers? Head to your grocery store and grab a rotisserie chicken or a turkey breast (usually right there by the chicken) and use that for your sauce. I like when traditional bolognese sauce is finished with a touch of cream, so I’m doing it that way for this turkey bolognese too. It doesn’t make it a cream sauce, just adds a richness to the sauce to round out the flavor. 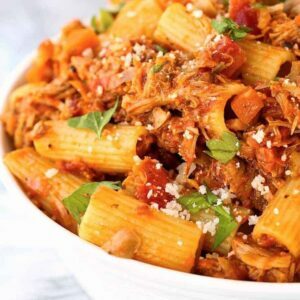 This pasta sauce recipe is hearty and filling and oh so delicious. Like I said, typically bolognese sauce is made with beef – in fact you can use this exact recipe and add ground beef instead of the turkey. Same process, same basic ingredients. The other ingredients in a classic bolognese are celery, carrots, onions and tomatoes. 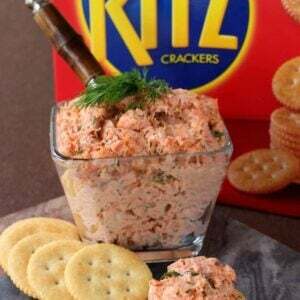 You can use canned diced tomatoes, tomato sauce or a combination of both. If you’re really jammed for time you can add your favorite jarred marinara sauce too! This bolognese sauce recipe is SO adaptable, it’s going to be one of your dinner recipe staples! What Kind Of Pasta Goes With Bolognese Sauce? You want a hearty pasta to hold up to this meat sauce. 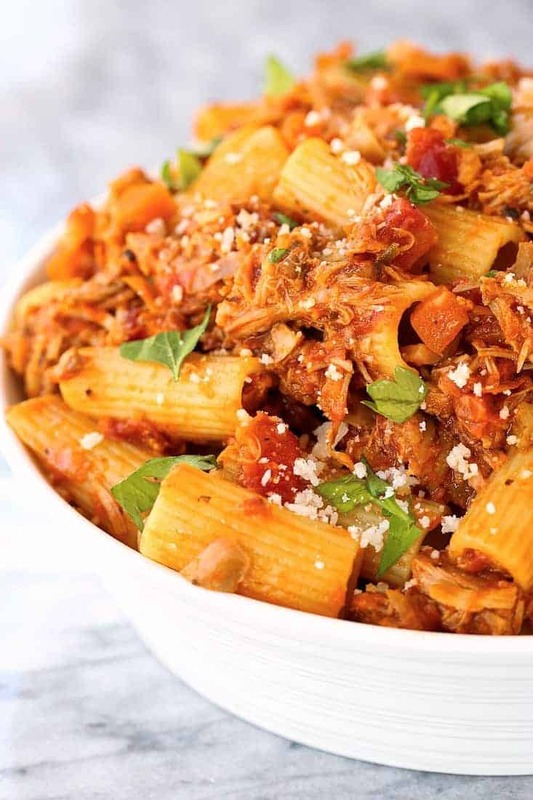 I like rigatoni or ziti with holes inside so that the meat sauce goes in the tubes of the pasta, getting more sauce with every bite. 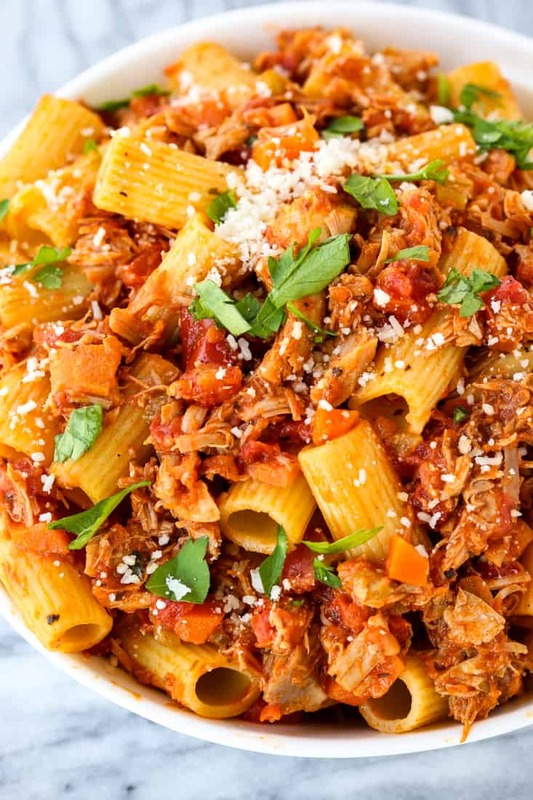 But this turkey bolognese isn’t just for pasta! Serve this meat sauce over baked potatoes, spoon it over rice, layer it on tater tots or french fries for a bolognese poutine or just eat it as it for a healthy, low carb meal. 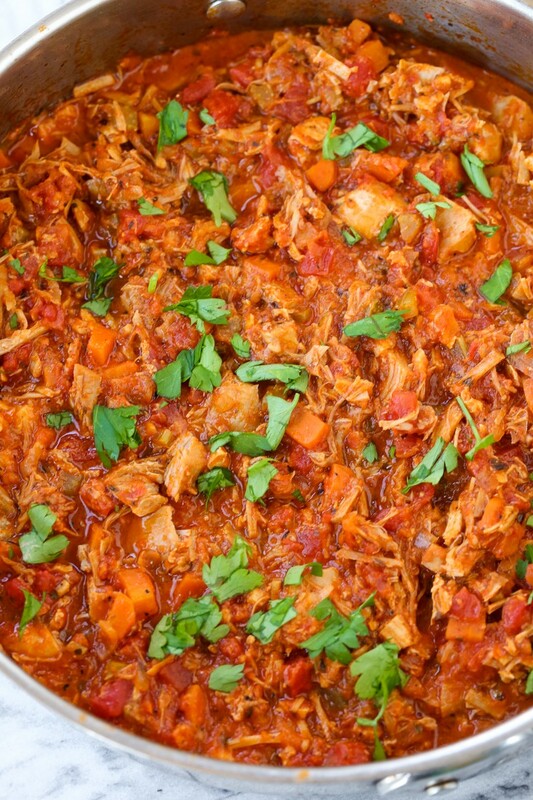 What Can You Serve With This Turkey Bolognese Recipe? W’ere huge fans of artichokes so our Grandma’s Stuffed Artichokes or these Roasted Brown Butter Artichokes go perfectly with most any pasta recipe. 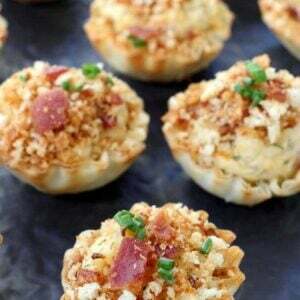 A classic Stuffed Cheesy Artichoke is always a hit too!